April 3, 2019 Louisville Bats placed 1B Hernan Iribarren on the 7-day injured list. April 2, 2019 1B Hernan Iribarren assigned to Louisville Bats. 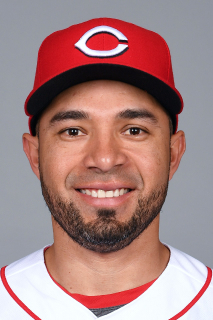 March 22, 2019 1B Hernan Iribarren assigned to Cincinnati Reds. November 2, 2018 1B Hernan Iribarren elected free agency. April 4, 2018 1B Hernan Iribarren assigned to Louisville Bats. March 25, 2018 1B Hernan Iribarren assigned to Cincinnati Reds. November 6, 2017 1B Hernan Iribarren elected free agency. April 20, 2017 Louisville Bats activated 1B Hernan Iribarren from the 7-day disabled list. April 6, 2017 Louisville Bats placed CF Hernan Iribarren on the 7-day disabled list. December 20, 2016 CF Hernan Iribarren assigned to Louisville Bats. December 2, 2016 Cincinnati Reds signed free agent CF Hernan Iribarren to a minor league contract. December 2, 2016 CF Hernan Iribarren roster status changed by Cincinnati Reds. November 7, 2016 CF Hernan Iribarren elected free agency. October 28, 2016 Cincinnati Reds sent CF Hernan Iribarren outright to Louisville Bats. October 5, 2016 OF Hernan Iribarren assigned to Caribes de Anzoategui. September 4, 2016 Cincinnati Reds selected the contract of CF Hernan Iribarren from Louisville Bats. April 23, 2016 CF Hernan Iribarren assigned to Louisville Bats from Billings Mustangs. April 12, 2016 2B Hernan Iribarren assigned to Billings Mustangs from Louisville Bats. April 8, 2016 2B Hernan Iribarren assigned to Louisville Bats. March 12, 2016 2B Hernan Iribarren assigned to Cincinnati Reds. December 2, 2015 2B Hernan Iribarren assigned to Pensacola Blue Wahoos. November 23, 2015 Cincinnati Reds signed free agent 2B Hernan Iribarren to a minor league contract. November 7, 2015 2B Hernan Iribarren elected free agency. September 29, 2015 2B Hernan Iribarren assigned to Caribes de Anzoategui. April 27, 2015 2B Hernan Iribarren assigned to Louisville Bats from Billings Mustangs. April 7, 2015 2B Hernan Iribarren assigned to Billings Mustangs from Louisville Bats. January 19, 2015 2B Hernan Iribarren assigned to Louisville Bats. January 15, 2015 Cincinnati Reds signed free agent 2B Hernan Iribarren to a minor league contract. October 9, 2014 2B Hernan Iribarren assigned to Cardenales de Lara. March 28, 2014 2B Hernan Iribarren assigned to Louisville Bats. March 9, 2014 2B Hernan Iribarren assigned to Cincinnati Reds. January 17, 2014 Cincinnati Reds signed free agent 2B Hernan Iribarren to a minor league contract. November 4, 2013 2B Hernan Iribarren elected free agency. October 9, 2013 2B Hernan Iribarren assigned to Cardenales de Lara. April 28, 2013 2B Hernan Iribarren assigned to Colorado Springs Sky Sox from Tri-City Dust Devils. April 6, 2013 Hernan Iribarren assigned to Tri-City Dust Devils. March 26, 2013 2B Hernan Iribarren assigned to Colorado Rockies. November 2, 2012 2B Hernan Iribarren elected free agency. October 11, 2012 RF Hernan Iribarren assigned to Cardenales de Lara. July 2, 2012 Colorado Springs Sky Sox activated 2B Hernan Iribarren from the temporarily inactive list. June 23, 2012 Colorado Springs Sky Sox placed 2B Hernan Iribarren on the temporarily inactive list. April 5, 2012 2B Hernan Iribarren assigned to Colorado Springs Sky Sox. January 31, 2012 Colorado Rockies signed free agent 2B Hernan Iribarren to a minor league contract. December 31, 2011 2B Hernan Iribarren transferred to Aguilas del Zulia from Cardenales de Lara. November 2, 2011 2B Hernan Iribarren elected free agency. October 12, 2011 Hernan Iribarren assigned to Cardenales de Lara. April 7, 2011 Colorado Springs Sky Sox placed 2B Hernan Iribarren on the 60-day disabled list. February 8, 2011 Colorado Rockies invited non-roster 2B Hernan Iribarren to spring training. January 5, 2011 Colorado Springs Sky Sox signed free agent 2B Hernan Iribarren. December 31, 2010 2B Hernan Iribarren transferred to Tigres de Aragua from Cardenales de Lara. November 6, 2010 Hernan Iribarren elected free agency. October 8, 2010 Hernan Iribarren assigned to Cardenales de Lara. March 24, 2010 Texas Rangers sent 2B Hernan Iribarren outright to Oklahoma City RedHawks. March 13, 2010 Texas Rangers claimed Hernan Iribarren off waivers from Milwaukee Brewers. December 28, 2009 2B Hernan Iribarren transferred to Leones del Caracas from Cardenales de Lara. October 19, 2009 Hernan Iribarren roster status changed by Milwaukee Brewers. October 9, 2009 Hernan Iribarren assigned to Cardenales de Lara. August 25, 2009 Milwaukee Brewers optioned Hernan Iribarren to Nashville Sounds. July 31, 2009 Milwaukee Brewers recalled Hernan Iribarren from Nashville Sounds. May 22, 2009 Milwaukee Brewers optioned Hernan Iribarren to Nashville Sounds. May 19, 2009 Milwaukee Brewers recalled Hernan Iribarren from Nashville Sounds. March 26, 2002 Milwaukee Brewers signed free agent 2B Hernan Iribarren to a minor league contract.